Pavenham - two walks of 5 and 3¼ miles at Pavenham Walking RouteFormed by a U-bend of the meandering Great Ouse, Pavenham is not only one of the oldest settlements along the river valley in Bedfordshire, but also one of the most attractive of the riverside villages. 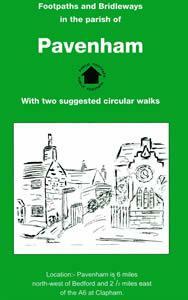 Start Point: Both circular walks start from the Village Hall. Formed by a U-bend of the meandering Great Ouse, Pavenham is not only one of the oldest settlements along the river valley in Bedfordshire, but also one of the most attractive of the riverside villages. How to get there by car/parking: From Oakley cross Stafford Bridge and continue into Pavenham Road. The Village Hall is on your right near the playing field.